The first set of photos just scream trumpet to me, so that's what I searched for. And sure enough, that's what they are: Trumpet Creeper (or more technically, Campsis radicans). As the phrase creeper suggests, they are actually vines, and not a tree or bush like I originally thought. They're just so tangled up with their host, that it was hard to tell they weren't one plant. 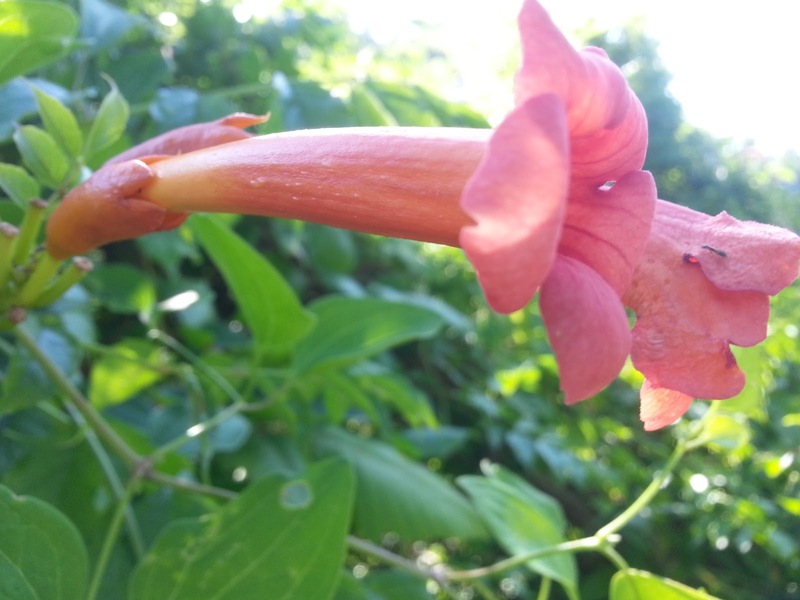 Trumpet Creeper (or Trumpet Vine) doesn't appear to have many uses. You can't eat it, and touching it may give you contact dermatitis. It is pretty to look at, and birds (apparently including hummingbirds) and insects like the flowers, so they probably make ideal photographic subjects. 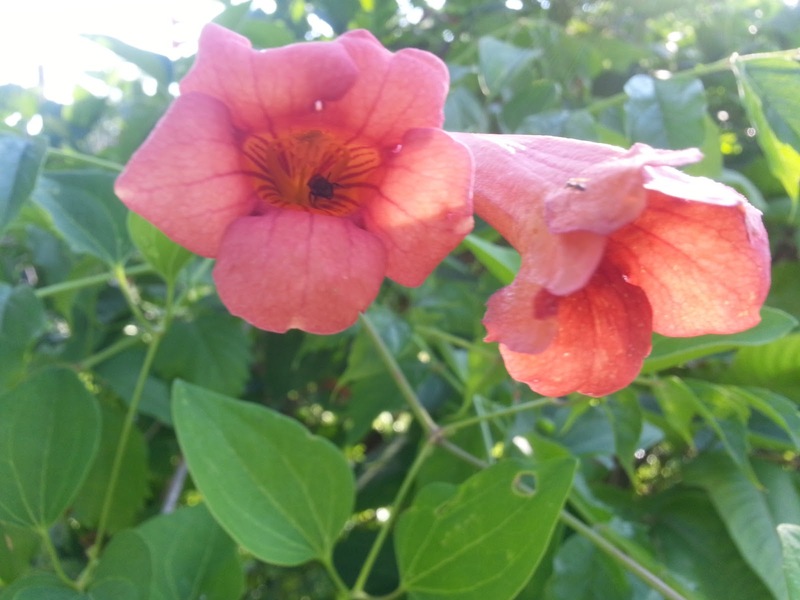 In fact, you'll notice in one of my photos above that there's an insect in the flower, which I didn't even realize till I started authoring this post. The second plant just looks like it should be Queen Ann's Lace, a plant I've heard of but never learned to identify. And it seems that it just may be. I wasn't able to get especially close to the plant to photograph all the details (it was off the boardwalk, and technically I was supposed to be running, not playing amateur botanist). Unlike Trumpet Vines, Queen Ann's Lace isn't just pretty, but has many uses, too. Including being edible, as it's the wild version of carrot that we eat. The roots and leaves are edible, and apparently you can fry up the flowers, which of course, must taste good. 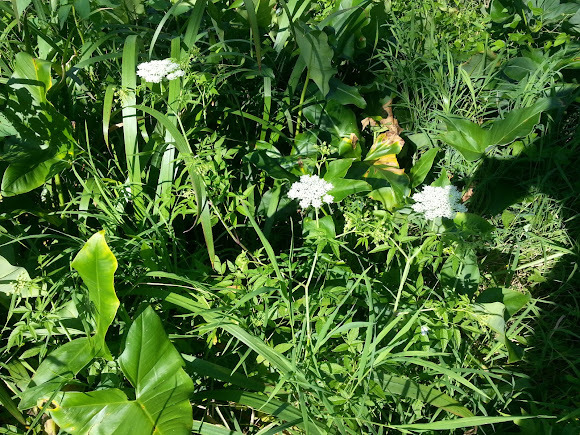 The only catch with the Queens Ann Lace is that it looks similar to Poison Hemlock and Fool's Parsley, both of which are poisonous, the former of which can kill you. 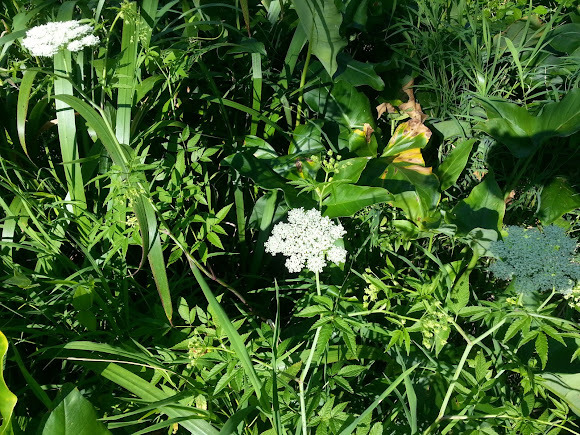 Update: Here are some links for putting Queen Ann's Lace to use: make salt, jelly, tea, and cake. And maybe even contraception! Overheard in DC: "none other than Helen Keller"